Explanation: Large clusters of galaxies are the most massive objects in the universe. Astronomers now realize that a hallmark of these cosmic behemoths are gas clouds with temperatures of tens of millions of degrees that pervade the clusters and radiate strongly in x-rays. 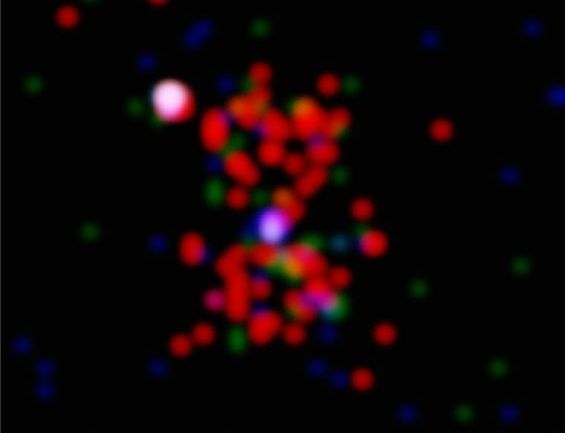 This Chandra Observatory image centered on a radio galaxy cataloged as 3C294 indeed reveals the telltale hot x-ray gas in an hourglass shaped region surrounding the dominant galaxy and shows the presence of a massive galaxy cluster in the distant universe. 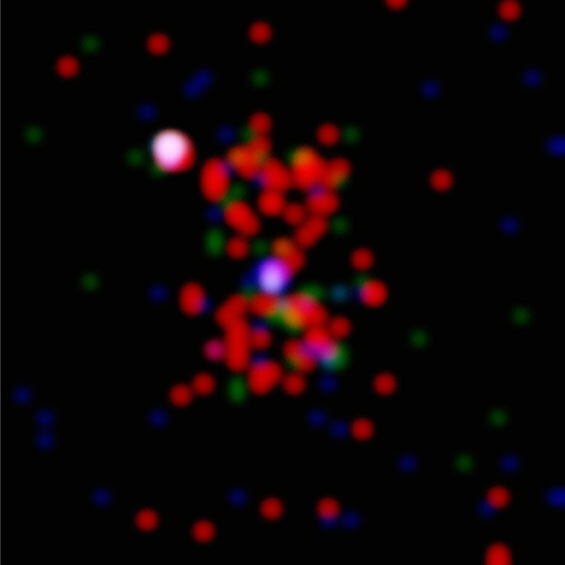 Here the picture is color-coded by x-ray energy, red for low, green for medium, and blue for high energy x-rays. The cluster associated with 3C294 is 10 billion light-years away making it the most distant x-ray galaxy cluster ever detected. Objects at that extreme distance existed when the universe was young, a mere 20 percent of its present age. Impressively, this observation demonstrates that even at those early times massive clusters of galaxies were already present.